One return today. 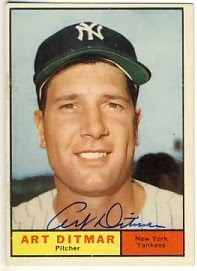 Art Ditmar signed his 1961 Topps to add to my collection. For whatever reason, Tuesdays are usually really bad for returns, but I managed to get one today. 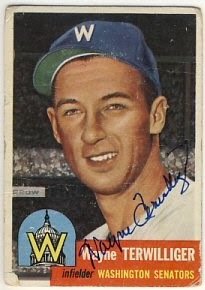 Johnny James signed his 1960 and 1961 Topps for me in just 6 days. 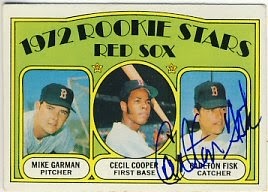 I sent in a 1972 Topps in for a Carlton Fisk signing a few months ago. The signing was delayed a bit, but I received it back today. I'm not sure if I'll have the other two players sign this card or not. 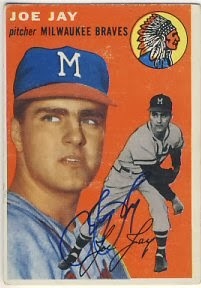 Maybe I'll start another one and send it off to Garman, who signs well through the mail. Then off to a Cooper signing if I can find one, and then finally off to Fisk again. Meanwhile, I'll hold on to this one in case the other one gets lost. My younger son and I headed over to the Har Mar Mall for a Brian Harper signing and card show. 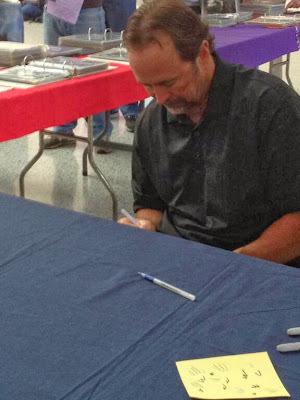 I was able to have him sign his bobblehead from the 1991 World Series set. He commented that he hasn't signed one of these yet. I only looked around the card show for a little while. I bought just one card to send out. 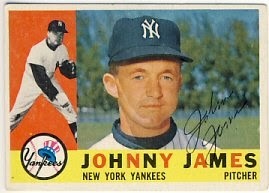 There were a few 1961 Topps high number cards I needed, but they were very expensive, so I didn't buy any. One return today. 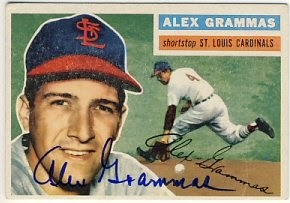 Alex Grammas signed his 1956 Topps for me. It's going to be slow for a while. I'm going to a card show on Saturday so maybe I'll pick up a few more cards to send out. 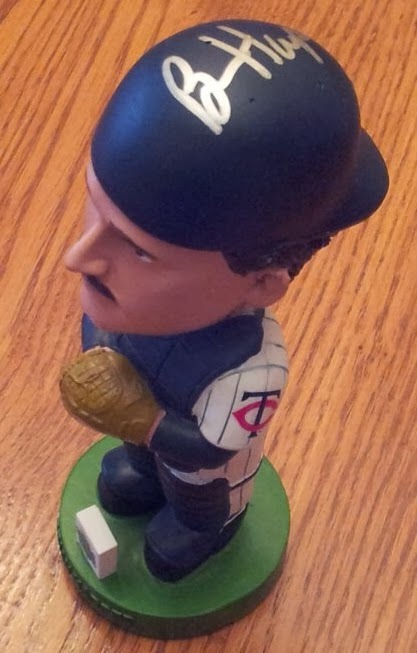 I'm also going to see Brian Harper at the show and will have him sign his 1991 World Series bobblehead. I received a very quick return today. 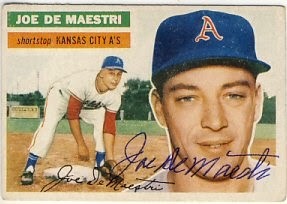 Joe DeMaestri signed a 1956 and 1958 Topps for me that I sent out Tuesday. The postmark was from Oakland, CA. I'm not sure how it got from Minnesota to California and back that quickly. I've been blogging for five years now. This is my 959th post. I've slowed down a bit because I'm just not sending out as many requests and not buying as much. 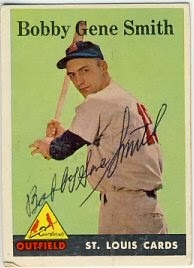 My basement is quite full, and I've sent out many of the cards I'm interested in collecting. 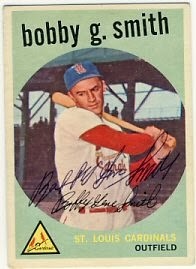 Lately, I've been narrowing in on those remaining cards from the sets I collect (1951 Bowman, 1958 Topps, 1965 Topps, and 1972 Topps). 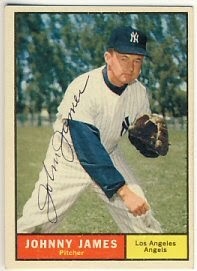 When I have a dry spell finding these cards, I send out a few from other vintage sets. I'm also focusing on my Twins collection, including signed bobbleheads, and miscellaneous vintage memorabilia. Thank you to all of you who read my blog regularly. I appreciate it! I received some great returns today. I took a chance by sending to some current players pretty late in the season but it paid off. 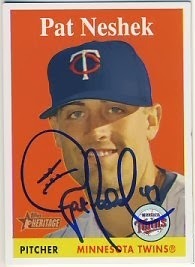 Remember when I asked anyone if they had a 2007 Topps Heritage Pat Neshek card to sell me? 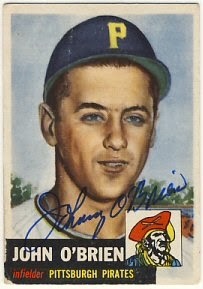 Well, I got one from a member on SCN and after sending it to the Oakland A's address, I received it back today. While updating my web site, I realized I had made an error back in 2007 when I updated it with a return from Pat. 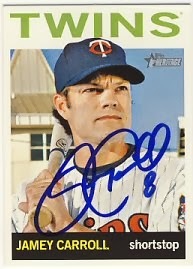 I actually sent and received a 2007 Heritage way back then, but when I updated my web site, I listed it as a 2007 Topps, and also referenced an image of a 2007 Topps I had signed by him. 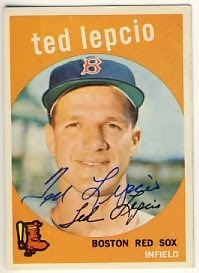 All along, I had this card signed and forgot about it! Oh well, now I have two. I wasn't sure how long it might take to get this back, since Neshek was sent down to the minors in August, and was back up in September, but he's not currently on their roster. So I wasn't really sure exactly where he was. 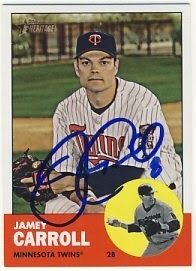 I also sent a couple of cards off to Jamey Carroll at the KC Royals address. 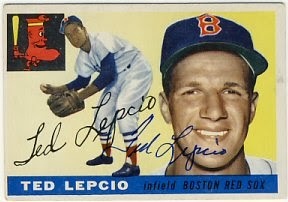 He's a great signer through the mail but it's late in the season so I didn't know if I'd see these come back. He was kind enough to sign them and return them to me. Carroll was one of my favorite players and I'm sad to see him go. He signed a 2013 and 2014 Topps Heritage for me. 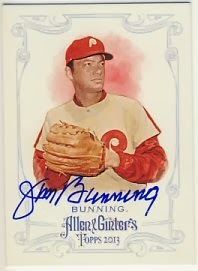 Finally, Jim Bunning signed his 2013 Allen & Ginter for me. 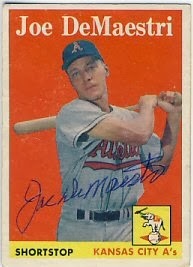 How many Hall of Famers will sign a card for free these days? 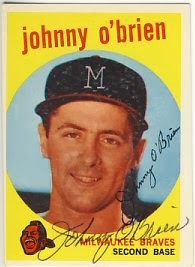 Let's see: Jim Bunning...Bobby Doerr... I think that's it. Thanks Mr. Bunning! Today I also received an eBay purchase. It's an odd item: a mock up of a potential advertisement for a radio station. 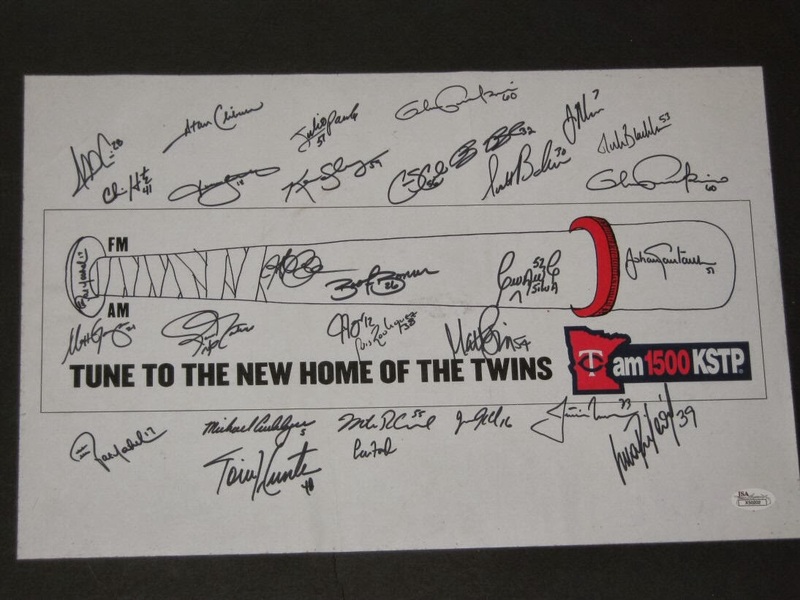 It's got 31 signatures on it although two of them are duplicates (Neshek and Perkins). Odd. It's authenticated by JSA. 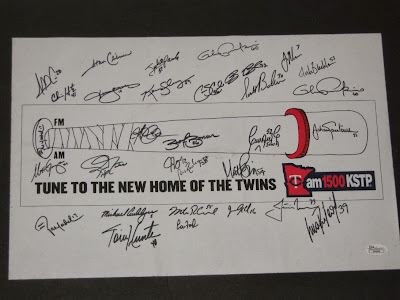 Pat Neshek (x2), Michael Cuddyer, Torii Hunter, Mike Redmond, Lew Ford, Jason Kubel, Justin Morneau, Juan Rincon, Matt Garza, Joe Nathan, Jason Tyner, Luis Rodriguez, Matt Guerrier, Josh Rabe, Boof Bonser, Carlos Silva, Johan Santana, Jesse Crain, Chris Heintz, Jason Bartlett, Julio DePaula, Kevin Slowey, Glen Perkins (x2), Carmen Cali, Brian Buscher, Scott Baker, Joe Mauer and Nick Blackburn. You can click on the image below to see a larger version. 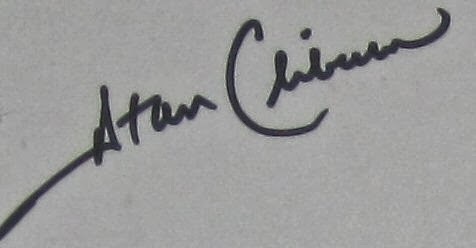 There's one autograph I can't identify. Here's a closeup of it. Any ideas? 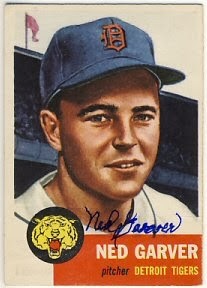 Ned Garver signed the 1953 Topps I sent and also enclosed a signed Diamond Signatures card for me. I received a couple of returns yesterday and two more today. 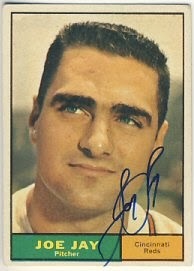 Yesterday, I received a return from Joe Jay, who signed his 1954 and 1961 Topps. 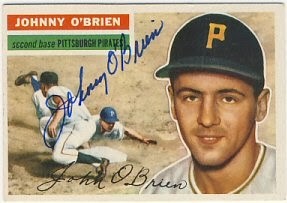 And Johnny O'Brien signed his 1953, 1956 and 1959 Topps. 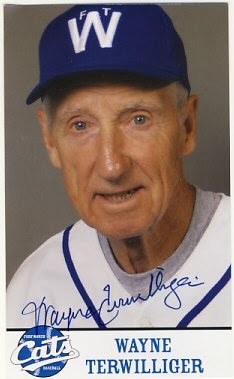 Today I received a return from Wayne Terwilliger, who signed his 1953 Topps and also included a signed postcard photo. 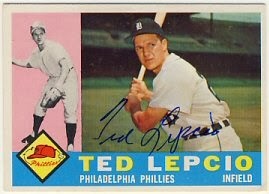 And Ted Lepcio signed his 1955, 1959 and 1960 Topps. I only have about 7 or 8 outstanding requests that I would expect back soon, so things could start slowing down. Two more returns today. Not bad for a normally slow Tuesday. 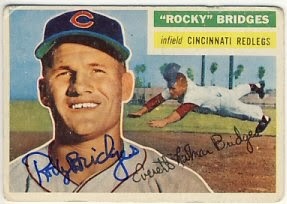 Rocky Bridges signed his 1956 Topps. 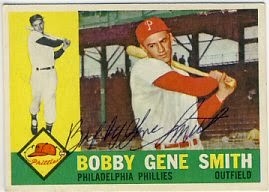 And Bobby Gene Smith signed his 1958, 1959 and 1960 Topps. I still have several requests out so I hope the returns continue at this pace for the next week or so.